You may not notice them at first, but service club members play a major role in our community. Read about four service clubs in our area and find out why their benevolent members are dedicated to helping others. The Freeport Noon Rotary Club strives to support area students. Members award nearly $6,000 in college scholarships, donate dictionaries to third-grade students, provide shoes for low-income children and assist other organizations like Salvation Army. You may see them handing out food at a local fair or reading to children at a school. But don’t expect them to ask for any credit. All they really want is your help in making the world a better place. Our neighbors belong to service clubs that, for the past century, have provided assistance to those in need while offering networking opportunities for ordinary members of the community. Long a part of our civic landscape, these clubs are facing a critical moment as a new generation enters the business world. Setting their sights on both the past and the future, these clubs are digging in on their mission to change the world. The Rotary Club has been active in Freeport for 100 years, and throughout that time it’s placed a special emphasis on helping young people in need. Among its many humanitarian projects, the Freeport Noon Rotary awards $6,000 in annual scholarships to area schools, donates dictionaries to local third-graders and provides shoes to low-income children. Each summer, the Rotarians send local students on a four-week exchange trip to a foreign country, exposing them to other cultures and languages. The Rotarians have also worked with the United Way on Dolly Parton’s Imagination Library, which provides new books for area children age 5 and younger. Rotarians host a fun holiday party for special-needs children, and they donate library books to area schools – just part of a laundry list of good works aimed at improving the lives of youngsters. The 55 men and women in Freeport’s Rotary range in age from the 30s to the 70s, and they’re raising the next generation of servants through dedicated school programs. At Freeport Aquin Catholic Schools, students can join Interact, a youth service group that works directly with Rotary. Rotary is also eyeing young professionals, with plans to create Rotaract, which allows young adults ages 18 to 30 to get involved in their communities while developing leadership and professional skills. Johnson says a younger crowd has joined Rotary in the past year, and he hopes to see the trend continue. Diverse as it is, the club’s membership seems to mesh well across its many generations. 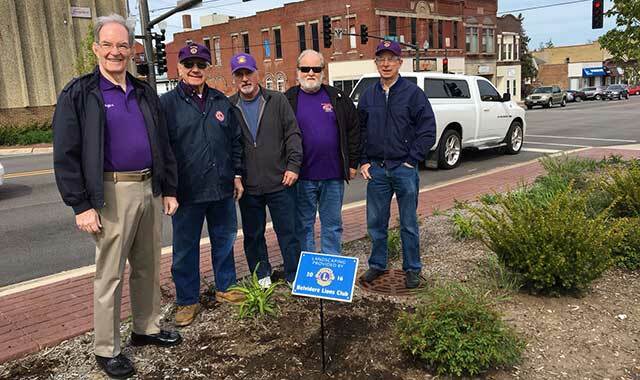 “The younger members draw on the experience of the veterans in the group, and that’s why the service projects and fundraisers that we do are a great opportunity to let your hair down and get to know your fellow Rotarians a little bit,” Johnson says. Members of the Belvidere Lions Club serve their community in many ways. They raise funds for those projects at some of the community’s biggest events, including the Boone County Fair and the Belvidere Harvest Festival. Jim Culvey was hooked on the Belvidere Lions Club at his very first visit. Members of the Belvidere Lions Club serve their community in many ways, and you’ll see them hard at work at some of Boone County’s biggest events, including the county fair, the Fall Diddley Craft Show and the Belvidere Harvest Festival. Funds raised at those events support four $1,000 scholarships given out to area high school seniors each year. The club also uses its resources and volunteer force to support the Center for Sight and Hearing in Rockford, a unique organization that helps those with sight and hearing disabilities to connect with support resources. Take a close look around Belvidere and you’ll see Lions Club collection boxes that accept donations of used eyeglasses and hearing aids. The Lions Club refurbishes them and provides them to people in need. Club members also maintain the junior varsity dugouts at Belvidere High School. Belvidere’s Lions Club started in 1939 with 26 members. Because so much of its membership was called to serve in World War II, it folded in 1944 but was re-organized two years later with 65 members. Today, with about 40 men and women, the club is comprised of business owners, factory workers, teachers and other professionals from the Belvidere area. It covers a wide swath of the community, but it’s short on one key demographic: 20- and 30-somethings. It’s not for a lack of trying. For years, the Lions Club has been connecting with area school districts to engage eager youths. Several area schools host their own Leo Club, a youth version of the Lions Club, whose members, like their Lion counterparts, participate in community service projects. Sometimes, they work side-by-side with their older counterparts or perform their own projects. They may gather eyeglasses from the Lions Club collection boxes or participate in a roadside cleanup. In an effort to appeal to young professionals, the Lions have also shortened their meetings and made them less formal. With just 10 active members, the Kiwanis Club of Beloit is fighting to maintain its good works and increase membership as it prepares to celebrate the organization’s centennial in 2020. Beloit’s Kiwanis Club started in 1920, just five years after the national organization formed in Detroit. Members first traded business ideas and performed community service before paying special attention to initiatives that help local students. The international club has made a mission of creating a lasting difference in the lives of children. One way its Beloit members do this is by sponsoring Bring Up Grades, or B.U.G., a reading program in the school system. With help from the Stateline Literacy Council, Kiwanis members read to children age preschool through second grade, and they hand out books that students can take home. In addition, the men and women of Beloit Kiwanis hand out nearly $8,000 in grants each year to local high school students and community organizations such as Big Brothers/Big Sisters and the Stateline Pregnancy Clinic. Kiwanis members raise funds through the annual “Peanut Days” event, so named because those who make donations receive a bag of peanuts as a thank you. The group also holds an annual all-you-can-eat pancake breakfast at Our Lady of the Assumption Catholic Church, usually in the fall. 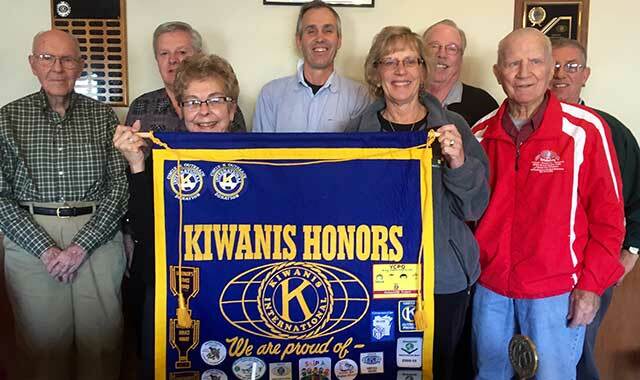 The club’s active presence in the community is made all the more impressive because Beloit Kiwanis maintains just 10 active members. Those 10 are making efforts to entice young people to join, but secretary Steven Hammill says it’s easier said than done. Hammill also believes younger generations are preoccupied with other pursuits. In its pursuit of new members, Kiwanis has offered free memberships, reduced the frequency of its meetings and invited guest speakers. 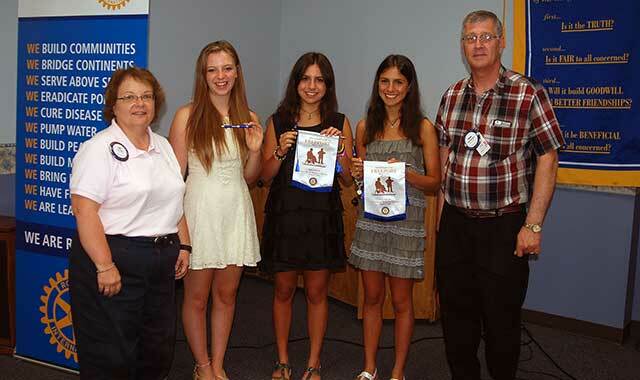 The group also sponsors a Kiwanis Key Club at Beloit Memorial High School, which helps students get involved. They sell homemade bracelets to raise funds for communities around the world. Youth involvement is one step forward, but getting people of any age to commit is no easy task, says Hammill. The Kiwanis Club’s centennial is right around the corner, and Hammill is intent on surviving the transition to a new generation. The Rockford Cosmopolitan Club awards $85,000 annually to local nonprofit organizations in the Rockford area. Combine a service club and a fraternity and you get a pretty close assessment of the Rockford Cosmopolitan Club. The Rockford Cosmopolitan Club is the largest service club in the area and within its international association, with more than 215 members. The group holds more than 40 events each year, hosting various luncheons, social events, community service events and four main fundraisers: the Premier Golf Classic, the Poinsettia Drive, the March Madness Raffle and Dinner, and the Charity Casino Nights. 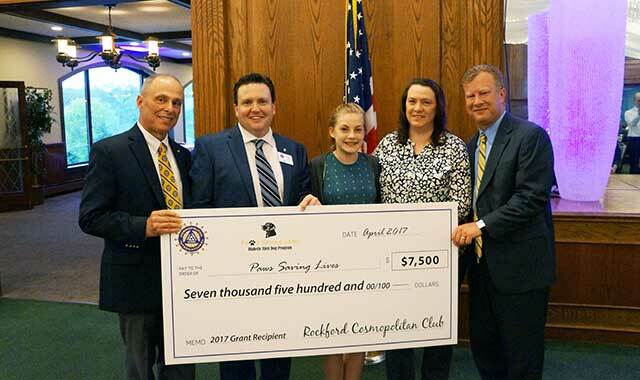 Through its Annual Grant Program, the club awards $85,000 annually to local nonprofit organizations including the Boys & Girls Club of Rockford and Midway Village Museum. Associated with the national Cosmopolitan Club, the Rockford “Cosmos” were founded in 1949 with a focus on fighting diabetes and providing service and support to worthwhile projects. The club has also started supplemental assistance for people needing a diabetic alert dog, which is specifically trained to sniff out low blood sugar counts. But the biggest beneficiary of the Cosmos’ generosity is Crusader Community Health in Rockford, which provides medical and dental care to underserved populations. As of 2016, the Rockford Cosmos had donated more than $500,000 to Crusader. When it’s not raising money, the Cosmo Club finds other ways to have fun. Members have toured each others’ “man caves,” reserved sell-out bus trips to Chicago Cubs games and boated on the Chain O’Lakes. The all-male group gathers men as young as 25 and as old as 91; about 35 to 40 percent of their membership is younger than 45. Perhaps because of its casual association, the Cosmo Club has had an easier time in its recruitment efforts. Over the past century, service clubs have made their presence felt in our region, through many means. These benevolent individuals have been called on to make their community a better place, and they’ve remained dedicated to that commitment. • Belvidere Lions Club: Meets the second and fourth Tuesday of the month, at 7 p.m., at Belvidere VFW Club, 1310 W. Lincoln Ave., Belvidere. • Freeport Noon Rotary Club: Meets the first, third and fifth Mondays of the month, at noon, at Stephenson County Farm Bureau, 210 W. Spring St., Freeport. • Kiwanis Club of Beloit: Meets the first and third Tuesday of the month, at noon, at Sophia’s Restaurant, 3201 Riverside Dr., Beloit. 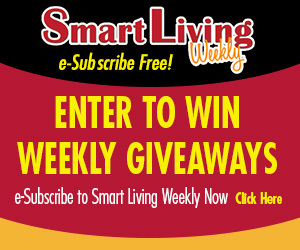 • Rockford Cosmopolitan Club: Meets every Thursday from late September through mid-May, at noon, at Forest Hills Country Club, 5135 Forest Hills Road, Rockford. To find additional service clubs near you, visit lionsclub.org, rotary.org, and kiwanis.org, and rfdcosmo.org. This entry was posted on Tuesday, April 3rd, 2018 at 12:00 pm	and is filed under Mind & Spirit, Top Posts. You can follow any responses to this entry through the RSS 2.0 feed. Both comments and pings are currently closed.